Ness City is a city in and the county seat of Ness County, Kansas, United States. As of the 2010 census, the city population was 1,449. Ness City is famous for its four-story Old Ness County Bank Building located downtown, and nicknamed Skyscraper of the Plains. Ness City was founded in 1878. The town experienced growth with the arrival of the railroad in 1886. Ness City and the surrounding county have suffered from the chronic decline in population common to rural areas of the Plains States since the 1930s known as the Rural Exodus. As evidence, fewer than 15 new homes have been built in Ness City in the past decade. The value of these homes and the per-capita build rate are both well below the national average for this period. As of the census of 2010, there were 1,449 people, 635 households, and 392 families residing in the city. The population density was 1,420.6 inhabitants per square mile (548.5/km2). There were 739 housing units at an average density of 724.5 per square mile (279.7/km2). The racial makeup of the city was 97.0% White, 0.3% African American, 0.1% Native American, 0.2% Asian, 1.6% from other races, and 0.8% from two or more races. Hispanic or Latino of any race were 8.9% of the population. There were 635 households of which 26.5% had children under the age of 18 living with them, 52.9% were married couples living together, 5.5% had a female householder with no husband present, 3.3% had a male householder with no wife present, and 38.3% were non-families. 35.9% of all households were made up of individuals and 17.1% had someone living alone who was 65 years of age or older. The average household size was 2.21 and the average family size was 2.85. The median age in the city was 47.5 years. 23% of residents were under the age of 18; 4.8% were between the ages of 18 and 24; 19.2% were from 25 to 44; 27.7% were from 45 to 64; and 25.3% were 65 years of age or older. The gender makeup of the city was 49.1% male and 50.9% female. As of the census of 2000, there were 1,534 people, 684 households, and 424 families residing in the city. The population density was 1,495.7 people per square mile (575.0/km²). There were 800 housing units at an average density of 780.0 per square mile (299.9/km²). The racial makeup of the city was 97.72% White, 0.07% African American, 0.39% Native American, 0.07% Asian, 0.59% from other races, and 1.17% from two or more races. Hispanic or Latino of any race were 2.28% of the population. There were 684 households out of which 25.3% had children under the age of 18 living with them, 55.0% were married couples living together, 4.7% had a female householder with no husband present, and 38.0% were non-families. 36.0% of all households were made up of individuals and 20.3% had someone living alone who was 65 years of age or older. The average household size was 2.17 and the average family size was 2.83. In the city, the population was spread out with 22.4% under the age of 18, 5.0% from 18 to 24, 24.6% from 25 to 44, 22.2% from 45 to 64, and 25.9% who were 65 years of age or older. The median age was 44 years. For every 100 females, there were 93.0 males. For every 100 females age 18 and over, there were 87.9 males. The median income for a household in the city was $33,068, and the median income for a family was $42,500. Males had a median income of $28,992 versus $18,553 for females. The per capita income for the city was $18,481. About 5.1% of families and 7.5% of the population were below the poverty line, including 9.1% of those under age 18 and 6.8% of those age 65 or over. 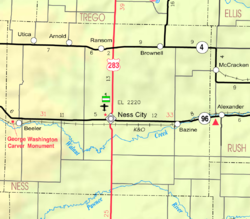 Ness City is located at 38°27′8″N 99°54′22″W﻿ / ﻿38.45222°N 99.90611°W﻿ / 38.45222; -99.90611 (38.452250, -99.905989). According to the United States Census Bureau, the city has a total area of 1.02 square miles (2.64 km2), all land. ^ Blackmar, Frank Wilson (1912). Kansas: A Cyclopedia of State History, Volume 2. Standard Publishing Company. p. 352. ^ "Monthly Averages for Ness City, Kansas". Weather.com. The Weather Channel. Retrieved August 15, 2013. Wikimedia Commons has media related to Ness City, Kansas. This page was last edited on 24 March 2019, at 15:12 (UTC).